How do you keep going when it feels like you've hit a brick wall and you're all out of strength to keep going against its opposition? I think we've all been there-- we've worked our tails off trying to accomplish something, only to encounter a problem or a setback we weren't expecting, and it knocks us down so swiftly it takes the breath right out of us. How do you keep going from there? Do you just pick yourself up, dust yourself off, and keep trudging along, hoping that the rest of the way is smooth sailing? Do you walk gingerly forward from here on out, anticipating chaos and crises at every turn? I don't personally feel that either of those options are very realistic. Sure, obstacles and problems come up and take us by surprise. But we don't have to live in fear or denial of them. I don't personally feel that either of those options are very realistic. Sure, obstacles and problems come up and take us by surprise. But we don't have to live in fear or denial of them. 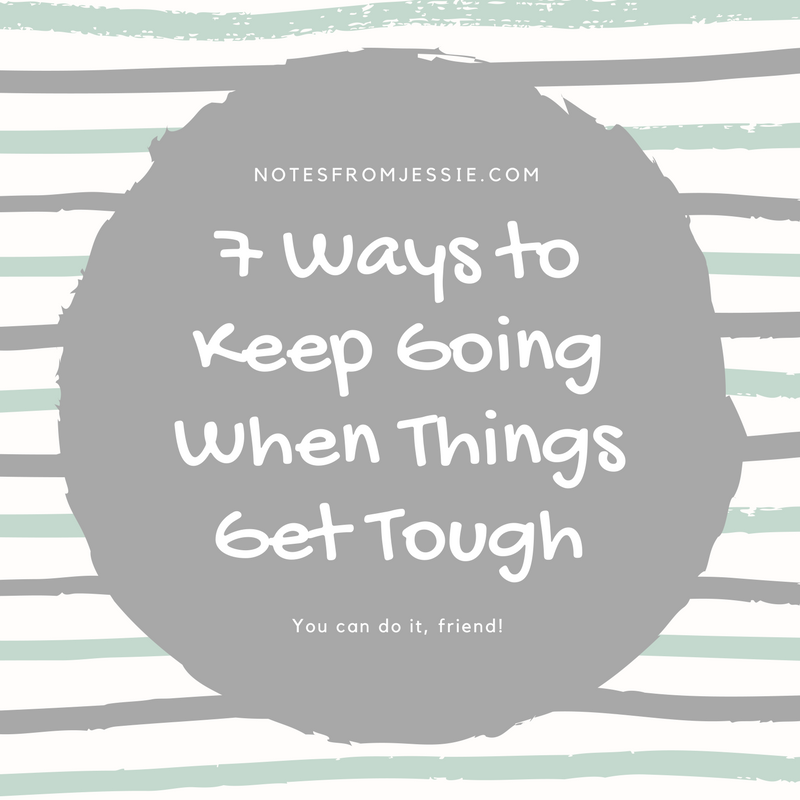 Instead, I've come up with seven ways to keep going when things get tough. You can choose whatever you like, but I have found it to be really helpful to have a short, repeatable phrase that I can call to the front of my mind or even say out loud to keep myself going when I feel my motivation begin to wane. Whether I'm pushing through a hard run, working on a dull work project, or trying to understand a confusing element of technology, it can be helpful to breathe and whisper a miniature pep talk to myself. Some of my favorites are "just keep swimming," (thank you, Dory! ), "you can do this," and "it's just a little bit longer." You can do just about anything for a minute, right? You can run for a minute, sit still for a minute, focus on a project for a minute, sit in gridlock traffic for a minute. What if, in the middle of thinking you can't do something, you were to flip the switch and tell yourself that you can do it, even for just one more minute? And then when that minute is up, you challenge yourself to continue for one more minute. Take things one step at a time. If you quit, then at least you made it longer than you initially thought you could, and you have an opportunity to push yourself an extra step or extra minute next time around. We often think asking for help is a sign of weakness as adults. But we don't think that about kids. If a child asked for help tying their shoes because they don't know how to do it themselves yet, we wouldn't berate them for their lack of knowledge or ability. We would bend down to help them out, showing them how to do it so they can learn to do it for themselves. We should be willing to do the same for ourselves on the receiving end of the helping hand. We all could use a little boost from time to time! Don't be ashamed to ask for help when you need it, whether it's in the form of a face-to-face interaction, online discussion forum, support email, or just asking someone to hold the door for you when your hands are full. If you've really hit a wall and feel like you just can't keep going, give yourself permission to stop for a moment. Then take a breath, rest for a moment, gather yourself, and then jump back in. Once you've given yourself a break and some time to rest, you can get back to your work with renewed energy and motivation. Slow and steady wins the race, my friend! There's no shame in taking a breather when you need one. When you're running out of motivation, imagine what it would feel like to reach your goal. Truly picture yourself getting there. Visualize yourself finishing your run, crossing the finish line, turning in your project, hitting "submit" on your application, or checking the box on your to-do list. Doesn't that feel good? Doesn't it make you want to push just a little harder to get there? Doesn't it make you believe that you really can make it there? Now that you've seen it, you can achieve it! When I get stuck feeling a lack of motivation, I remind myself why I'm pursuing my goals. I like to draw my attention back to the beginning of my journey, when I was fresh and excited about the road ahead. By dialing it back and reminding myself of why I started in the first place, I can get another boost of energy and motivation to see me through my slump. Sometimes it seems like the road ahead of me goes on forever, like I'll never reach my end goals. But if I look back at how far I've come, I'm aware that I have been making progress, even if it's been slow going. It reminds me that I can do whatever it is that I'm trying to do. In a similar way, celebrating small wins reinforces our behavior, highlights our successes, and gives us the momentum we need to keep going through the rough patches. I love celebrating small victories for that very reason-- it gives me something positive to focus on, taking my attention away from any frustration or disappointment I might have about any mistakes or lack of progress, and it gives me the reassurance I need to know I can continue going and making progress. Those are my tips for pushing through tough times and situations. Do you have any tips? I'd love to hear from you in the comments!